The tall chimney of ”Windscale piles” in the English countryside of Cumbria. Post war technology limits implied that the shortest route to produce plutonium for an atomic bomb was to build a reactor using natural uranium as fuel, moderated with graphite and cooled with air. Thus, in 1946 the construction of two reactors known as the Windscale piles was launched at a former munitions factory in Sellafield. 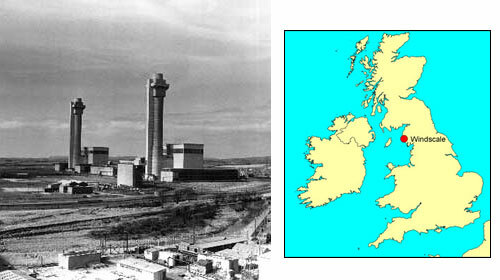 In a remarkably short time, the first reactor was commissioned in October 1950, the second one eight months later.